I was assigned to make a drawing that emulates the work of artist/professor Ben Stone. 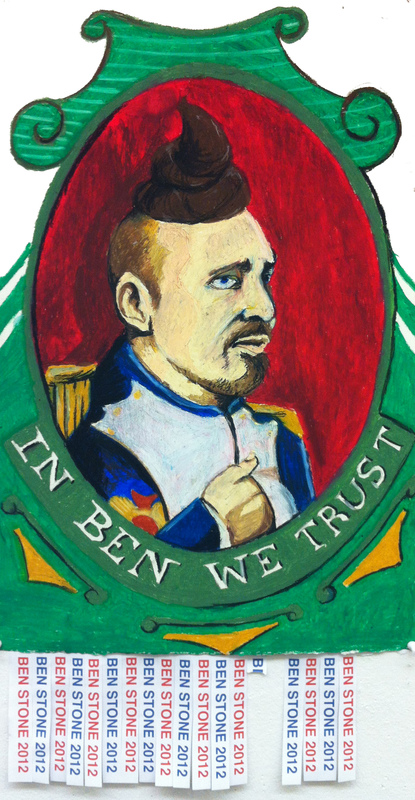 Ben, for those who don’t know, mostly works in sculpture, and NOT drawing/flat media. So I had to analyze how Ben thinks. And I decided to do a piece based on how Ben Stone would see the 2012 presidential election. And that would be to run for President. The idea is based on the absolute absurd nature of the political race and how so many people seem to be ignorant to that absurdity. SO, My thought was, that Ben Stone would put together a political campaign based in the ridiculous (Hence the Napoleon complex and the Poop hat.) This ridiculous underground campaign would try to subtly enter into the world, to see just how numb people have become to the non-sense of 2012 politics.